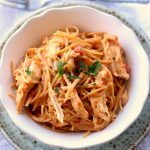 Instant Pot Chicken Spaghetti–creamy spaghetti with shredded chicken blasted with tons of flavor from seasonings and a can of Rotel. An easy weeknight dinner that your whole family will love. Make it quickly in your electric pressure cooker. 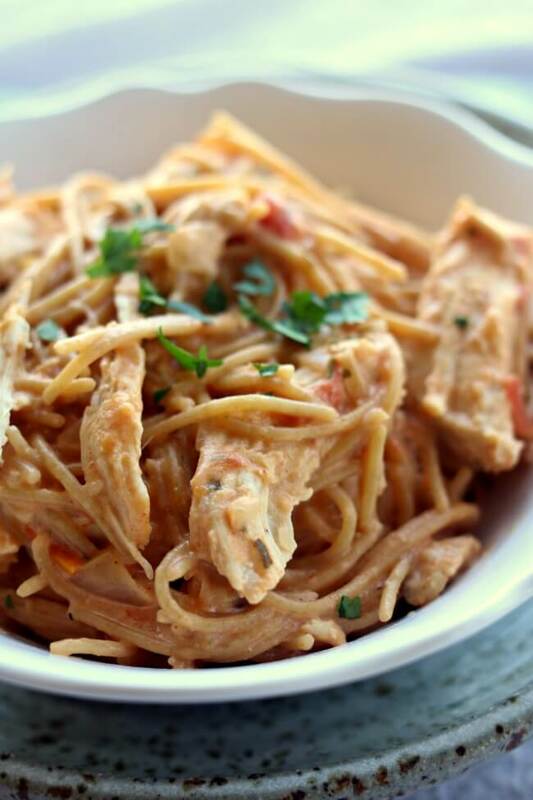 This instant pot chicken spaghetti must make it on your menu this week. I’m seriously in love with this dinner. It is so creamy and yet so flavorful. My whole family loved this dish! You start this recipe with a can of rotel. Rotel is just diced tomatoes with diced green chilies. I opted for the mild version. Add in some chicken broth or you can use water with some Better Than Bouillon. I always have Better than Bouillon on hand in my refrigerator so that’s what I used. I buy the big jar of it from Costco. It’s my fave! Then add in some chicken breast halves. I used 2 chicken breast halves which weighed about 1 1/2 pounds. 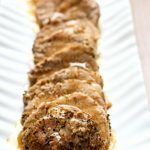 Mine were not frozen but you can totally use frozen chicken breast halves in this recipe. Use the same cooking time listed below. The pot will just take a bit longer to come to pressure. Toss in a diced onion (I used yellow onion), ranch seasoning, garlic salt and paprika. I buy the big jar of Hidden Valley Ranch Seasoning from Costco but you can just buy a packet of it next to the salad dressings if you want. At this point you’ll pressure cook the chicken for 10 minutes. If I have time I always like to let the pressure release on its own (natural pressure release) rather than doing a quick release when I’m making chicken. This seems to help the meat stay tender and moist. If you don’t want to wait you can let the pressure release naturally for 10 minutes and then move the valve to venting. You’ll remove the chicken and place it on a cutting board and then shred it up. Add the spaghetti into the pot and turn up the heat by using the saute setting. I used the lowest saute setting on my Instant Pot which is labeled as “less.” Because the spaghetti is so thin it will only take 5 minutes to cook and get soft. Add in the cream cheese and cheddar and stir until creamy. This recipe is best when served immediately but if you have leftovers you can store them in an airtight container in the fridge. UPDATE 9/18/18–There is a second way to make this recipe where you cook the spaghetti and chicken at the same time! View the video below to see the method in action! One thing that I wish I would have added is mushrooms! I love mushrooms and I think it would have been perfect in this instant pot chicken spaghetti. Next time! If you do decide to add fresh mushrooms I would add the sliced mushrooms at the beginning with the chicken. For Instant Pot Spaghetti Chicken I used my 6 quart Instant Pot Duo 60 7 in 1*. I also own the 6 quart Instant Pot IP-LUX60 V3 Programmable Electric Pressure Cooker. * They are both great pressure cookers! The first one I mentioned has a yogurt making function but other than that they are fairly similar. The price difference between the two is about $20. 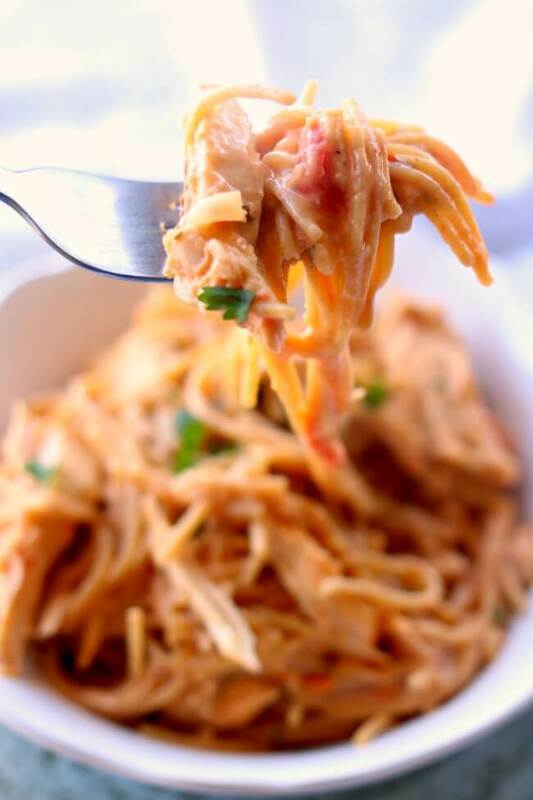 Creamy spaghetti with shredded chicken blasted with tons of flavor from seasonings and a can of Rotel. An easy weeknight dinner that your whole family will love. Make it quickly in your electric pressure cooker. There are two ways to make this recipe. The first is when you cook the chicken separately from the spaghetti. This would be a good method for someone who does not have a pan that fits inside their Instant Pot or for someone who is doubling the recipe. The second method is for someone who has a pan that fits inside their Instant Pot. Make it either way! Add the entire can of Rotel into the Instant Pot. Add in 1 1/2 cups chicken broth, chicken, onion, ranch seasoning, garlic salt and paprika. Give a quick stir. Cover the pot and secure the lid. Make sure valve is set to sealing. Set the pressure cook button (mine says “manual”) to 10 minutes on high pressure. When the timer beeps let the pressure release on its own for at least 10 minutes. If you have time do a full natural pressure release. If not, move the valve to “venting.” Remove the chicken and place on a cutting board. Turn the pot to “saute” setting. Put it on the lowest saute setting (mine says “less”). Add in the uncooked spaghetti. Stir every minute or so. It will take about 5 minutes to cook. 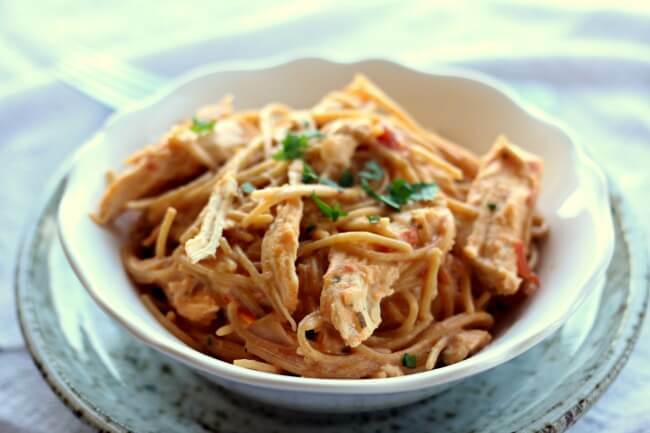 While the spaghetti is cooking, shred the chicken. When spaghetti is almost cooked stir in the cream cheese and the cheese until it is melted. Stir in the chicken. Serve spaghetti immediately if possible. Store leftovers in an airtight container in the refrigerator. Add the entire can of Rotel into the Instant Pot. Add in 3/4 cup chicken broth, chicken, onion, ranch seasoning, garlic salt and paprika. Give a quick stir. Break the spaghetti (I used whole wheat spaghetti) in half to fit inside your pan that fits inside your Instant Pot. I used this one*. Cover with 2 cups of water. Cover the pan with a lid or with foil. Lower the pan on top of the chicken (I used a sling…see the video for what I mean). Remove the lid. Remove the spaghetti pan (use gloves so you don’t burn your fingers). Drain off excess water from spaghetti. Remove the chicken and place on a cutting board. Shred it up. Turn the pot to “saute” setting. Add in the cream cheese and the cheese until it is melted. 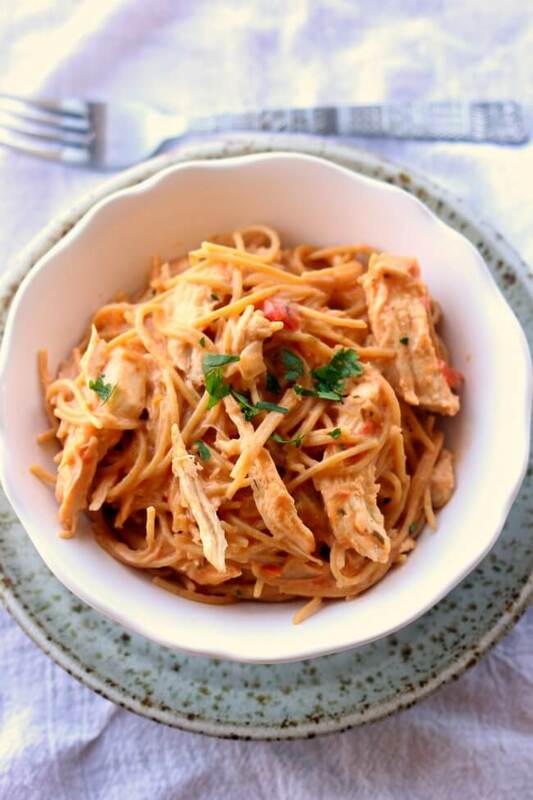 Stir in the chicken and spaghetti. Recipe adapted from Ashley Moyer. Get all my new recipes delivered to your email inbox by signing up below. what would I have to do to double this recipe? my family LOVES this! I have 6 qt. I just got done making it and it’s awesome my husband said an my son liked it too I couldn’t believe it. I think next time I’m gonna add the mushrooms. I know I will be making this again great recipe. This was ok. Won’t be saving the leftovers. Can the lower calorie cream cheese be substituted? We made this as written and it was fabulous! Has anyone used a rotisserie chicken with the recipe and if so, how did you adjust the instructions? I haven’t tried rotisserie yet but I’m glad you liked it! I loved tne chicken spaghetti & the chicken taco bowl. 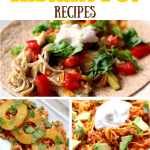 I love your recipes & the 2 different versions. Also I appreciate your detailed instructions! The only thing I would ask for in your perfect recipes is nutritional values; calories, fat, sodium, cholesterol, etc. Thanks for considering the request. Wow your changes sound delicious! I’m glad I could inspire you in some way. I made this and we loved it. Do you think I can make this in the 3qt. instant pot? I want to make this as a second main dish to see how the family likes it for our family dinner night? I will be using my 6qt IP for another main dish. I bet it would fit! Great recipe! Fast and tasty. Everyone loves it. Next time will add sun dried tomatoes. 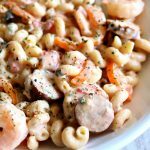 What are the carbs and calorie count on this good recipe? Awesome! I made this tonight and it will be in our regular rotation. So good!!! I didn’t see the comment about same cooking time if frozen and added 3 minutes. Also, I didn’t have chicken breasts and used boneless, skinless chicken thighs. Still amazing! I added mushrooms. Excellent addition. Also, added salad olives but must not have added enough as we didn’t find them. Honestly, I’m so pleased to find this delicious instant pot recipe. Thank you! instead of cream cheese? I bet that would be amazing. be making it again for the two of us. Finally made this tonight as written and it was fabulous! My husband loved the cheesiness. I like a little heat so next time I think I’ll chop up some jalapeno. Also went with the mushrooms. 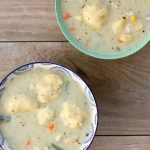 I made this recipe exactly as written, and it is amazing! My husband loved it as well and it was delicious the next day when we had leftovers too. I look forward to making it again! Glad you enjoyed it! We love this one too! I made it with mushrooms – 8 oz of cremini from a Costco pack that were huge and I sliced thin. Next time I’ll use more – they added a great taste top the dish. I, too, found that I needed an extra 1/4 cup of water when cooking the spaghetti. My partner abhors “spicy food” so I went with a can of Italian seasoned stewed tomatoes instead of Rotel, but added hot sauce to my dish to add the flavor back in. This recipe will be on standard rotation. That sounds awesome with the mushrooms! Made this as my first IP meal on the recommendation of a friend. I had an enormous frozen breast and 10 min plus 10 min natural release was not enough, it was still raw in the middle by a lot. So I threw it back in and brought it to pressure and cooked 4 more min, quick release, and that did the trick. Maybe because I had to pressurize twice but there was not enough liquid to cook the spaghetti – I added some more chicken stock to get enough liquid. After melting in the cheeses, I should have added even more stock as it was so thick I could barely stir and it tasted a bit dry. Overall we really liked it and I’d make it again – hopefully it would go more smoothly and come together faster now that I know the chicken breasts we get at Sprouts are so huge they need longer to cook. Okay, this is good to know! Thanks for sharing! Just finished making/eating this and couldn’t wait to give it five stars. What adjustments will I need to make in order to double the recipe? One batch isn’t enough to feed four plus leftovers. Just double all the ingredients straight up. No need to change the cooking time. How do gluten free noodles hold up in an instant pot? Hi Joe, I honestly don’t know because I have never tried it. Sorry I can’t be more helpful. I’ve heard from a few people that they have used gluten free and it has worked well. Made it tonight in the Elite Pressure cooker and it will be on the List of Favorites. Husband said to make sure it becomes a regular. Thank you Karen! Awesome Amber! I haven’t heard of the Elite pressure cooker. Do you like it? I made this for the first time tonight and it was delicious. My husband is a big fan and so am I. We ate it over zoodles instead of spaghetti to save calories and carbs. This recipe is delicious! My husband said it was his favorite thing I’ve made in the Instant Pot. I cooked my spaghetti noodles separately to avoid all the stirring. They cooked while the instant pot was releasing. This recipe is a keeper. Thanks!! I did a very similar thing last night. I boiled the spaghetti separately, but only 6 minutes so that when I added them to the broth while I was shredding the chicken, the noodles would cook faster. This was huge hit in our house last night, thank you so very much! We didn’t use the onions, only 2 of the 4 of us like onions, but the rest of the recipe we followed exactly. This is the best dinner I made in my Power Cooker since I got it for Christmas. Yumm!! This is so good!! My kids loved it and husband had seconds then packed it for his lunch. Only change I made was adding 15 oz of tomato sauce. I’ll make again! Thank you! Absolutely awesome! This made my husband happy to have Chicken! This was delish! 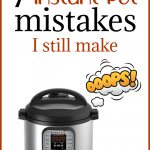 It was the first recipe I tried using my Instant Pot. Easy peasy! I added mushrooms in while cooking and then while sauting, added a 1/4 cup of sliced spanish olives. My hubs raved about it. Thanks for the great recipe! I used a can of salsa. oh yum on the olives idea! We don’t have Rotel Tomatoes and Chilies in Canada. What would be a good substitute? Should I just use a can of dices tomatoes and add a fresh jalapeno pepper? Just use a can of diced tomatoes and a can of green chiles. I’ve done that before and it has worked well. I like the petite diced tomatoes. I think jalapeno would be too spicy. Green chiles don’t add heat just flavor. For those in Canada, I tried the recipe with a can of Aylmer Accents Chilli Seasoning diced tomatoes. It turned out great. what could you use instead of the packaged ranch stuff?? How many minutes will i add for frozen chicken breasts? Keep the minutes the same. Amazing. Our guests loved it. 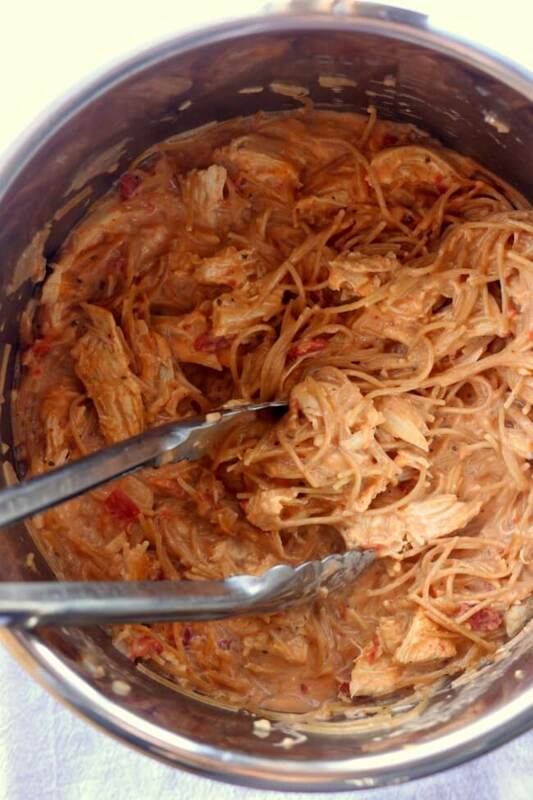 We did it with 3 pounds of chicken, a little more broth, a little more cream cheese, and about 3/4 pound of spaghetti. HP for 14 minutes. NR for 9 minutes. Great, easy meal. So glad! This is my fave lately. 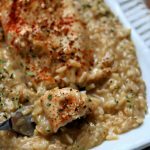 Is it possible to do with frozen chicken? Your Chicken Spaghetti was so delicious! Saturday in my Instant Pot, and the spaghetti on the stove after church Sunday. I served the sauce and spaghetti in separate dishes so the pasta stayed al dente. A salad rounded out our meal . It was a hit. Thank you for posting the recipe. I am curious as to the Nutrition Values per serving, please of this recipe, as published. It sounds so good.